We’re currently knee-deep in the second wave of digital transformation. The first wave persisted for over a decade as companies disrupted industries on the back of mobile and the as-a-service model. Now, innovative technologies like artificial intelligence, machine learning, blockchain, and the Internet of Things (IoT) are driving the second wave of digital transformation. Unfortunately, the computing models that enabled success in the first wave of digital transformation aren’t enough to to make you thrive moving forward. 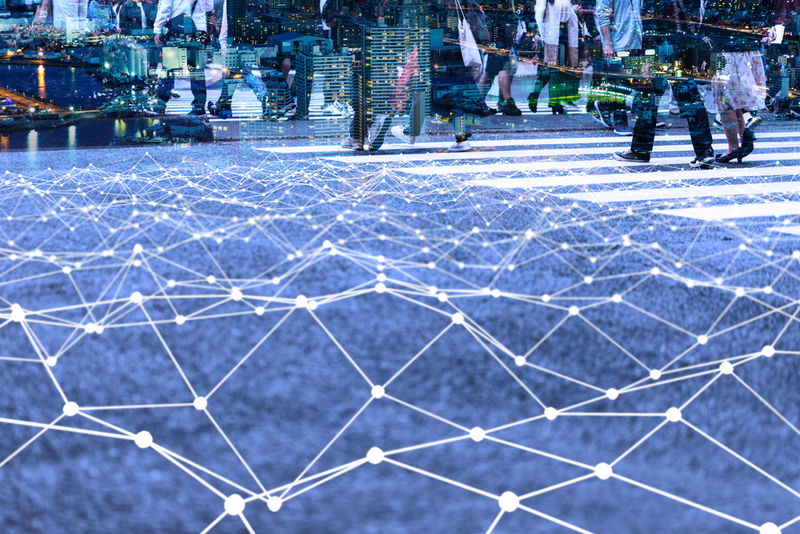 Instead of trying to decide whether or not edge computing will replace cloud computing, we need to take advantage of both to address all aspects of digital transformation. One reason why edge clouds and public/hybrid clouds are so complementary is that they take vastly different approaches to data processing. Your traditional cloud computing models were great for emerging mobile and SaaS use cases because of their batch processing power. Massive volumes of raw data are collected throughout the network and funneled back to big data analytics, ERP, and CRM platforms for batch processing. This gives you the opportunity to perform historical analysis and glean actionable insights for your business. However, the hub-and-spoke model of cloud computing has its limitations. Data collection is reliant on connectivity to cloud servers and there’s always a certain amount of latency because of the distance packets must travel. Hub-and-spoke style clouds can’t support the demands of IoT innovation for use cases like local analytics, industrial remote monitoring, and any other low-latency tasks. In cases where batch processing isn’t enough, edge computing applies the OODA Loop concept (observe, orient, decide, act) to data processing. Data is collected by edge devices and analyzed locally, enabling you to derive real-time insights and act accordingly. 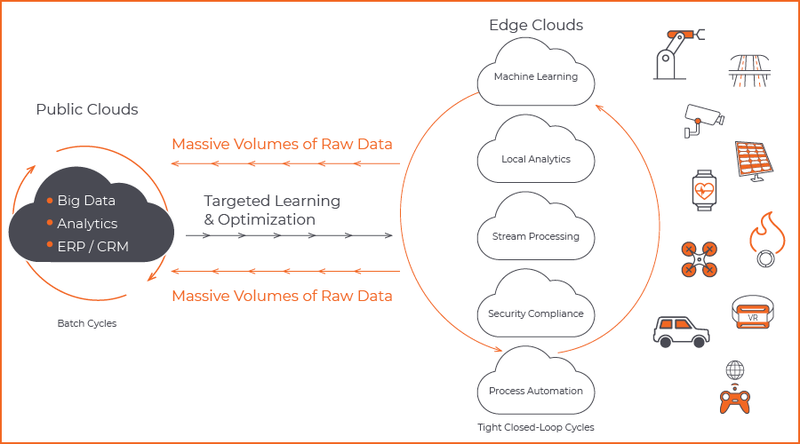 With edge clouds, you get targeted learning and optimization that scales to meet the demands of second-wave digital transformation technologies. These edge devices can determine which data is useful for historical analysis and send it back to the central public/hybrid clouds for batch processing. The difference in processing techniques highlights the main reason why edge clouds and traditional clouds are complementary. But this difference leads to a number of other distinctions to keep in mind. Public/hybrid clouds operate within web-scale, information-centric data centers that are orchestrated through scripting-based provisioning. This model works best when not asked to deliver real-time capabilities. Edge computing, on the other hand, operates on a massively distributed pool of resources. The closed-loop, intelligent automation that governs these resources almost eliminates latency so data can be analyzed at the source and insights come instantly. Taking that idea a step further, edge computing is deployed in a dynamic topology, making it flexible enough to adapt as it analyzes data. This unlocks machine learning use cases that aren’t possible with the pre-defined models of traditional cloud computing. Remember that these differences shouldn’t lead you to choose one model over the other. Rather, keep them in mind so you can choose the best model for specific use cases—and make sure you can integrate them properly. At a time when rapid decision making and flexibility are highly valued, it’s not surprising that some people want to put edge computing and cloud computing against each other. If you’re talking about specific use cases, there’s validity to those conversation. However, when you’re talking about your network as a whole, the focus should be on integrating edge clouds and traditional clouds seamlessly. Ready to learn more about how edge clouds and public/hybrid clouds can work together to drive business results, check out our white paper about the rise of digital twins.